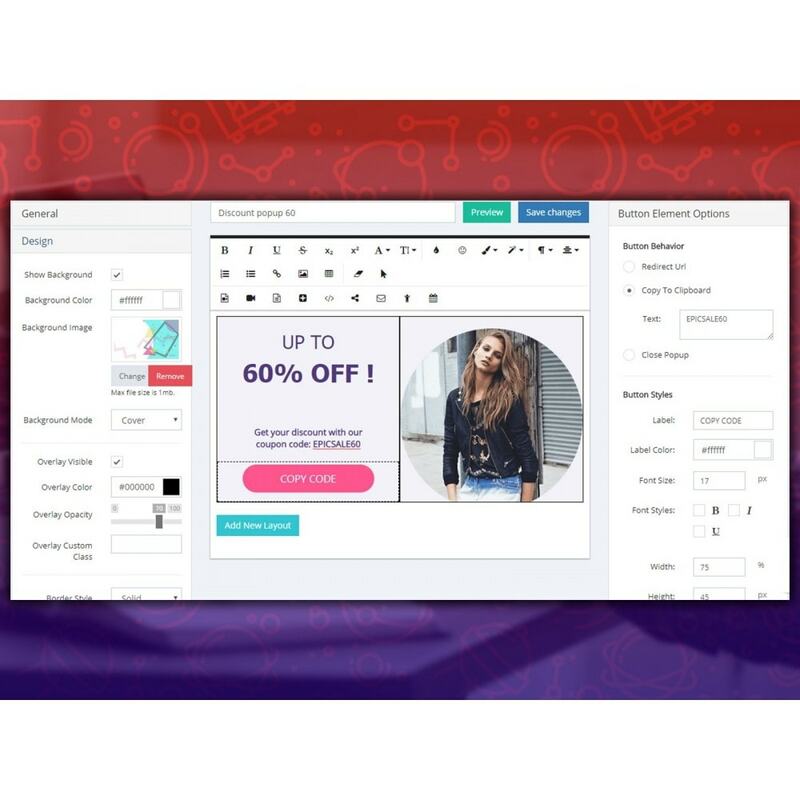 Popup Maker is specialized in popup marketing and provides all the essential tools to increase your sales and revenue via popups. This is a professional tool to provide you with a guaranteed success on your PrestaShop website. 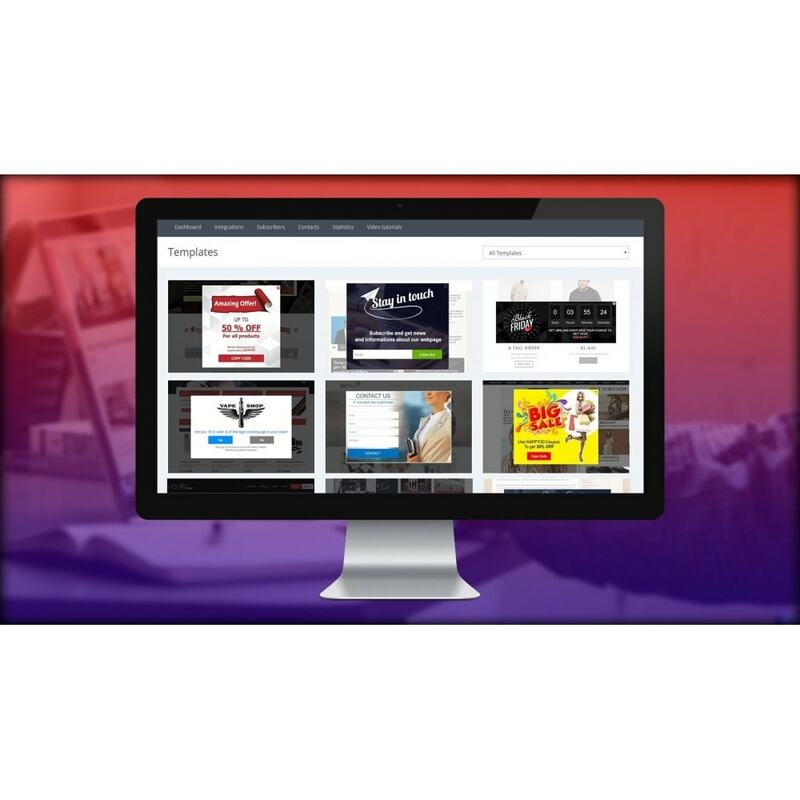 Iframe popup element - easily integrate 3rd party widgets inside the popup and display on your site. Video popup element - include video URLs inside the popup to show your promotional ads, tutorials, music videos, or anything you wish inside a popup. Subscription popup element - this popup element is the ultimate tool to help you grow your email list, getting more subscribers every hour, every day. Button popup element - insert a button and customize the call-to-action events on your website. You can use the button to show discount coupon codes to your users that can be copied right from the button. HTML popup element - insert any piece of HTML tags inside the popup and get the custom design and functionality you wish for your popup. Social popup element - make your content more social and popular with the social buttons included in the social popup element. 9 social network buttons are available for your choice. Contact form popup element - keep in touch with your customers and provide support through a contact form element. Age restriction popup element - limit the access to your site content and avoid Google penalties including an age restriction popup on your site. PayPal button element - is the ultimate tool to bring extra sales to your PrestaShop store. Google Maps element - show any location you wish with a nice map inside a popup! 1. On Load - insert the popup onload and it will appear as soon as the page is fully loaded. 2. On Scroll - select some amount of percentage of your page and the popup will appear when one scrolls down to that part. 3. On Click - add your custom CSS class to the element on your site and the popup will open when someone clicks on that element. 4. On Hover - add a custom CSS class to any element on your site and the popup will show up when someone hovers over that element. 5. Exit Intent or exit popup - 4 exit intent popup modes are available: Soft mode, Aggressive1, Aggressive2 and the Full (enables all mentioned). 6. Inactivity - set some time period after which the popup will appear automatically, in case the user stays inactive on the page. 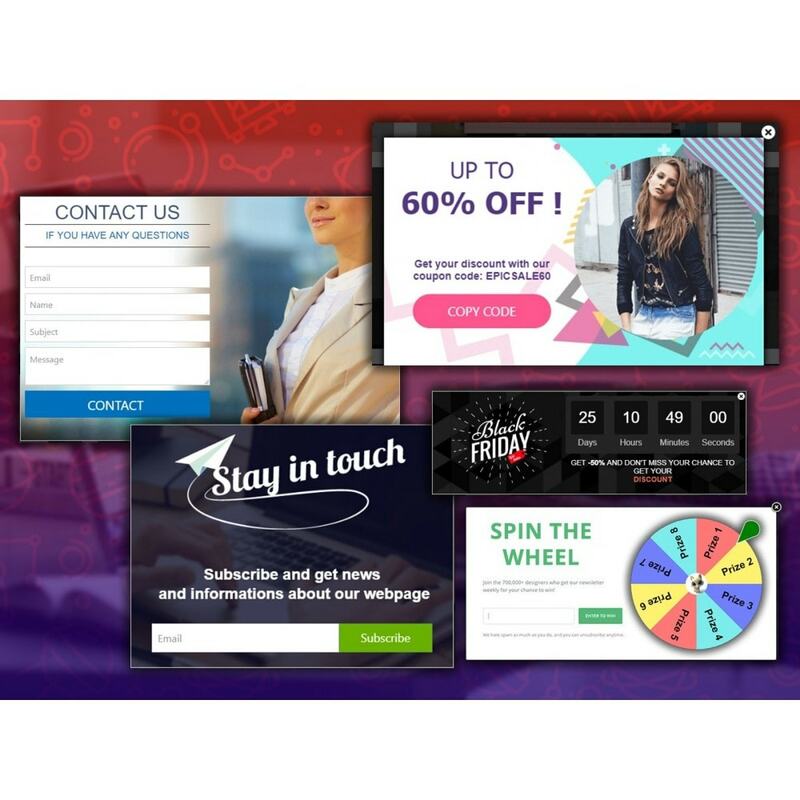 We provide popup templates for different purposes easing the process of popup creation for our users. 2) The first thing you should do to start working with Popup Maker add-on is to connect the addon to your Popup Maker account via API key (The API key can be found in the Settings section of your Popup Maker service account.). 3) After connecting, on your PrestaShop's dashboard from Popup Maker's addon, you will see all your popups. 4) Click on the pencil/edit button and then select the pages you want to show the popup.